3Fisheries Technology and Aquaculture College, Arab Academy for Science and Technology, Alexandria, Egypt. 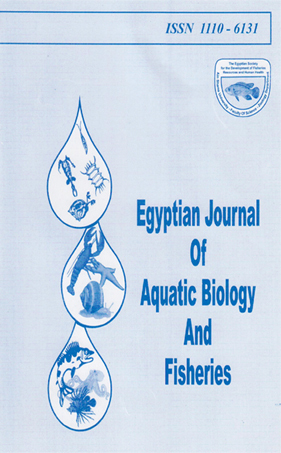 4Fishery Biology Lab, National Institute of Oceanography and Fisheries, Cairo, Egypt. A total of 856 gilthead sea bream, Sparus aurata (Linnaeus, 1758), was collected from different landing sites of Bardawil Lagoon between October 2011 to September 2012, in order to investigate its population dynamics. The age distribution covered age groups 0 to IV. Total length ranged from 10 to 34.2 cm while total weight varied from 10.8 to 568 g. The length-weight relationship parameters were a = 0.0146 and b = 3.0062. The estimated parameters of the von Bertalanffy growth function (VBGF) in length were K = 0.370 year-1, L∞ = 39.17 cm and to = -0.65 years. The estimated total length at first capture (Lc) was 12.85 cm, while the total length at 50% maturity (Lm) was 22.7cm. The rates of total mortality (Z), natural mortality (M) and fishing mortality (F) were 1.085, 0.394 and 0.691 year-1, respectively. The exploitation ratio (E) was estimated as 0.637, so the finding result revealed that the stock of S. aurata in Bardawil Lagoon is heavily exploited.